Get a Visa® reward card for up to $500 when you Spring for Something New with Samsung. 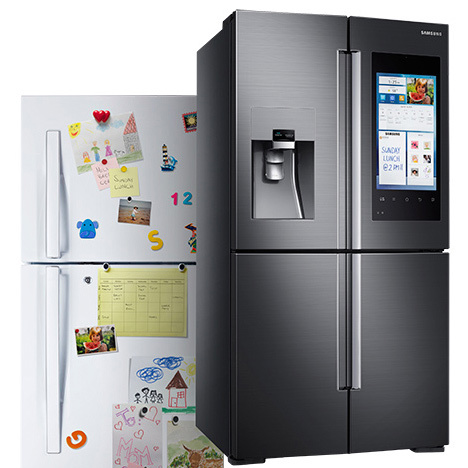 Purchase at least 2 qualifying Samsung Home Appliances (Cooking, Laundry, Vacuum, Refrigerator or Dishwasher) valued at $1,500 or more, and you'll get a Visa Reward Card.^ Prices refer to actual out-of-pocket pre-tax, post-discount, post-promotional cost of products; delivery and other charges excluded. We're sorry, this offer has ended. We are no longer accepting registrations for the Spring for Something New. All information must have been submitted by August 14, 2018 at 11:59:59 PM ET. Already registered for this gift? ^After submitting valid Offer Claim Form and receipt. Offer claim Form must be submitted by August 14, 2018. Supplies are limited. Terms and Conditions apply. Must be an eligible legal resident of the 50 US/DC & at least 18 years old to participate. Terms and conditions apply. Purchase at least 2 Samsung Home Appliance products (Cooking, Laundry, Vacuum, Refrigerator, or Dishwasher) between 3/1/18 and 5/16/18 from a participating retailer in-store or online. Must submit valid offer claim form online by 8/14/18 or mail-in postmarked by 8/14/18 and received by 8/21/18. After offer claim form is validated, Samsung will send, depending on your Qualifying Purchase amount: a $150 Visa® Reward Card if you purchase 2 or more products for $1,500 or more pre-tax; a $300 Visa Reward Card (if you purchase 3 or more products for $3,000 or more pre-tax; a $500 Visa Reward Card if you purchase 3 or more products for $5,000 or more pre-tax. One claim per household. Additional restrictions apply. Click here for full terms and to submit offer claim form and purchase receipt. Offer is valid and can be combined with other Samsung offers, rebates, programs, or promotions unless otherwise stated. Offer is not valid on purchases made from Costco or Lowe’s. The OmniCard Visa Reward Card is issued by MetaBank®, Member FDIC, pursuant to a license from Visa U.S.A. Inc. The Visa Reward Card can be used everywhere Visa debit cards are accepted. No ATM Access. This optional Offer is not a MetaBank nor a Visa product or service; and neither MetaBank nor Visa endorse this Offer. Purchase a combination of two or more Samsung Home Appliance products (cooking, laundry, vacuum, refrigerator, dishwasher) from a participating retailer in-store or online between March 1, 2018 and May 16, 2018 and save your receipt. See Offer Description above for Qualifying Purchase requirements. Submit an Offer claim form using one (1) of the following two (2) methods (either Online or Mail-in): a. Online: i. Visit samsungpromotions.com/Springpromo (“Website”) to access the online Offer claim form. ii. Complete and submit the Offer claim form by following the on-screen prompts to provide the required information including but not limited to: participant’s full name (no initials), complete mailing address (no P.O. Boxes), valid email address and telephone number. Participants will not be allowed to change their mailing address or email address after submitting. iii. Provide date of Qualifying Purchase and upload a photograph of the original register receipt showing the Qualifying Purchase by August 14, 2018. The file must be in .JPEG, .JPG, or GIF, format and may not exceed 12MB. b. Mail-in: Participant must legibly and fully complete the Offer claim form found at the bottom of the Terms and Conditions and mail it with the Qualifying Purchase receipt in an envelope to The Samsung Home Appliance Spring for Something New Offer, P.O. Box 251328, West Bloomfield, MI 48325 (collectively, the “Mail-In Envelope”). The Mail-In Envelope must be postmarked by August 14, 2018 and received by August 21, 2018. To find your serial number please check the side trim and bottom of your appliance. If you continue experiencing difficulty in finding your serial number, please contact Samsung customer service at 1-866-888-5503.